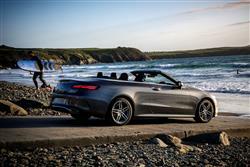 With this generation Mercedes E-Class Cabriolet, petrol power firmly takes centre stage for top models. One of the most desirable variants is the one we're going to try here, the 333bhp 3.0-litre V6 E400 4MATIC model. It's a consummate all-rounder. 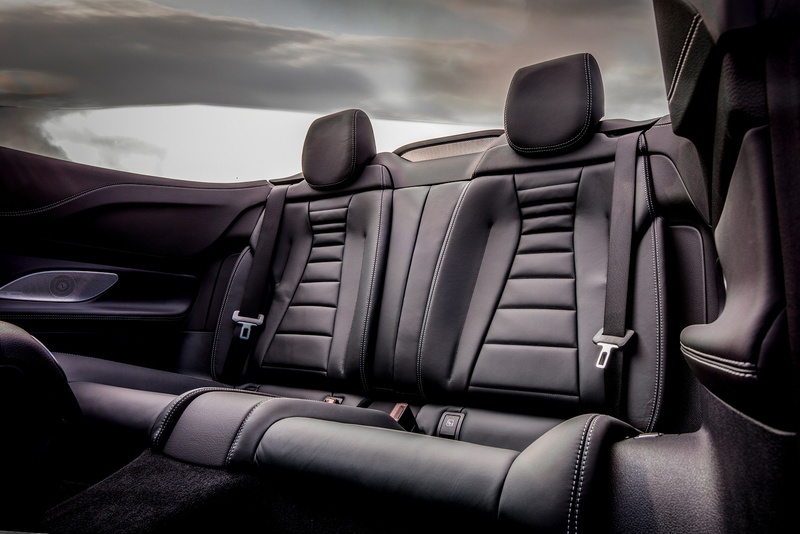 Other German premium brands offer you one option if you're in the fortunate position of being able to decide upon a prestigiously badged premium executive class cabriolet. 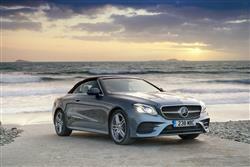 Mercedes though, offers two, the C-Class Cabriolet and the E-Class Cabriolet. The latter design is our focus here, in its top mainstream E400 4MATIC petrol form. 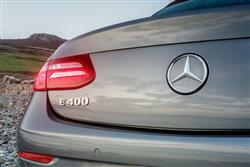 Once, an E-Class Cabriolet buyer looking for the most desirable mainstream engine in the line-up would probably have signed up for the E350d V6 diesel variant, but with the recent backlash against black pump-fuelled motoring, variants like this E400 are gaining in popularity again. Let's put it to the test. Mercedes had already established the market demand for 4WD models of this kind with the previous generation E-Class Cabriolet. This time round there are also E220d and E350d diesel models equipped with the brand's on-demand '4MATIC' system - plus there's the top petrol version we elected to drive, the 333bhp 3.0-litre twin turbocharged V6 E400 petrol model. This makes 62mph from rest in just 5.3s and has to be artificially restrained at 155mph. It's certainly a very refined thing, especially when you're cruising along at highway speeds, roof-down with the 'AIR CAP' device activated on the top of the windscreen to reduce buffeting. 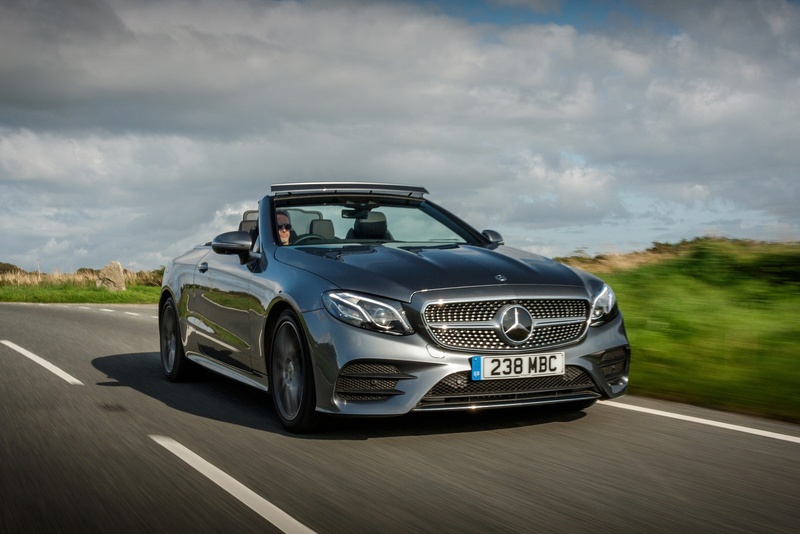 At motorway speeds, most convertibles are usually quite unpleasant with the roof down, but this E400 is quiet, easily allowing you to conduct a conversation with your passengers without raising your voice. What this car isn't is any kind of real sportscar - but then if you wanted one of those with a Mercedes badge, you'd probably have bought the brand's SLC model. Still, bodyroll is well controlled and there's no undue twist and flex from the chassis, even over quite pronounced bumps. 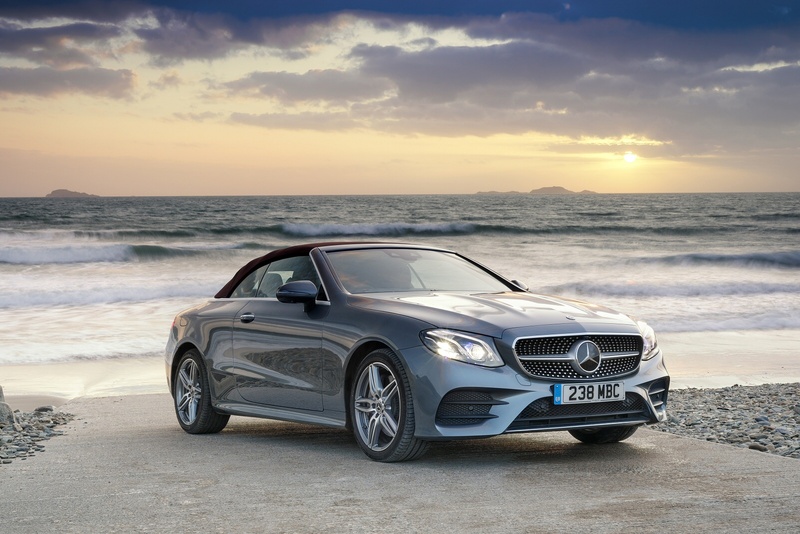 As with all E-Class Cabriolet models, you get 9G-TRONIC nine-speed automatic transmission and the DYNAMIC SELECT system that allows you to tweak steering feel, throttle response, gearshift timings and stability control thresholds to suit the way you want to drive. Plus there's now the option of super-smooth air suspension if you want it too. When the soft top is up, the E-Class Cabriolet has a silhouette similar to that of the E-Class Coupe. A striking front section with a low-positioned diamond radiator grille and centrally located star, LED High Performance headlamps, a drawn-out bonnet with powerdomes and fully retractable side windows underline the more dynamic looks of this generation model. The fabric soft top is available in dark brown, dark blue, dark red or black. More importantly, it can be fully opened and closed in 20 seconds when travelling at a speed of up to 31mph and buyers can specify the AIRCAP electric draught-stop system and the AIRSCARF neck-level heating system. The roof's multi-layered structure with sophisticated insulation reduces wind and driving noise, which makes it easy for the occupants to hear each other talk, even when driving at high speed. 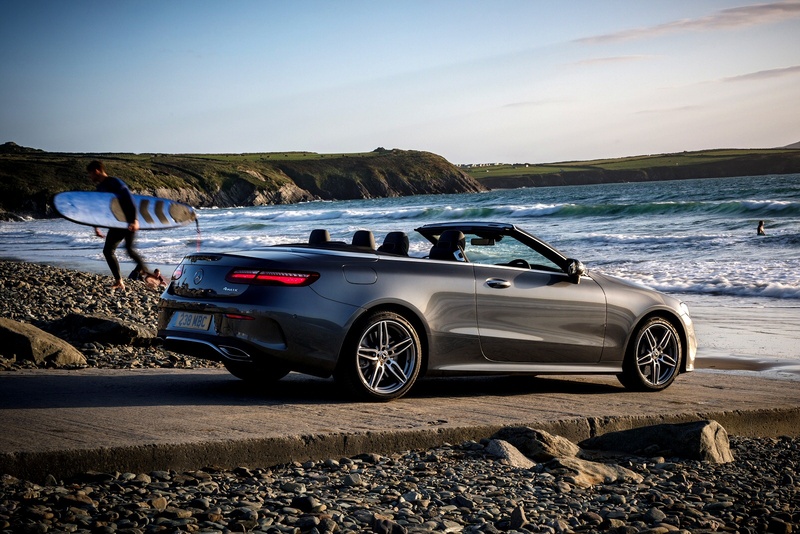 The soft-top structure is equally effective when it comes to climate comfort, making the Cabriolet suitable for use all year round. After opening, it folds down into a bespoke compartment in the boot and a retractable cover separates the soft top from the remaining boot space. The boot capacity of 385-litres (310-litres when the roof is open) means the E-Class Cabriolet doesn't compromise too much on practicality. Plus 50:50 folding rear seat backrests create a through-loading feature for longer items. You won't be expecting this top mainstream petrol-powered E-Class Cabriolet variant to be inexpensive - and it isn't. You'll need a budget of around £56,000 for this E400 4MATIC derivative; to give you some perspective, the entry-level point to the range is about £10,000 below that. A V6 diesel E350d 4MATIC model will cost you about the same as this E400, but there, you only get 258bhp to play with, rather than 333bhp. There's a kind of 'junior Bentley' feel about this car that gives it a more up-market feel than you'd get in any C-Class Cabriolet. Yet the outlay needed for ownership shouldn't require too many potential owners to need a lottery win first. Those who do have more to spend will inevitably be plied with plenty of options. We'd be tempted by the AIR BODY CONTROL air suspension to get a magic carpet-style ride. And the full COMMAND infotainment system would also be nice to have, including a 'COMMAND Online' feature that give owners access to the 'Apple CarPlay' and 'Android Auto' 'phone connectivity systems. Weight-saving measures, aerodynamic improvements, fuel-saving electronic Direct Steering and low rolling resistance tyres feature among the eco-measures implemented with this car, along with an ECO Start/Stop function to cut the engine when you don't need it, stuck in traffic or waiting at the lights. As a result, if you keep an eye on the optimum gearchange indicator, the E400's V6 petrol engine can return a combined economy figure of 39.2mpg and around 194g/km of CO2. Insurance is rated at group 44E. What else? Well, we'll tell you that the comprehensive three year unlimited mileage warranty is built upon by Mercedes' Mobilo scheme which delivers breakdown cover for up to thirty years, as long as you continue to have your car serviced at a Mercedes main dealer. 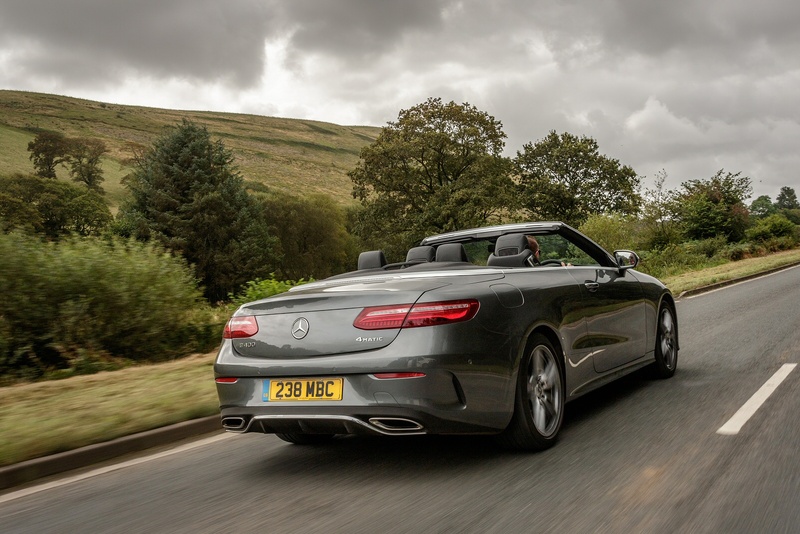 It's also worth mentioning that the optional 'Mercedes me' connect services package includes remote self-diagnostic capability, enabling your E-Class Cabriolet to monitor wear and tear items and alert your local dealer to let you know if something needs seeing to. If you�re looking for a new Mercedes-AMG E-Class E53 4Matic+ Premium Plus 2dr 9G-Tronic Petrol Coupe for sale, you�ve come to the right place. 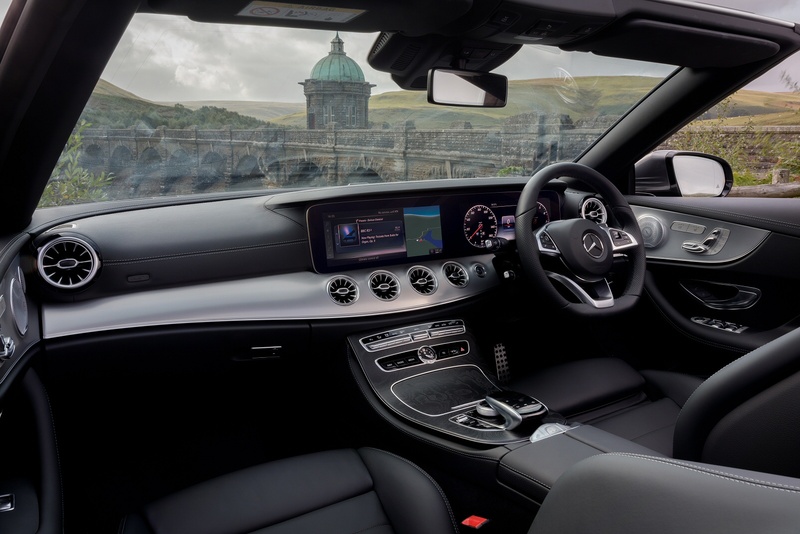 At Bristol Street Motors we don�t just have the best Mercedes-AMG E-Class E53 4Matic+ Premium Plus 2dr 9G-Tronic Petrol Coupe deals, we also offer friendly advice and help with all your enquiries to ensure your buying experience is a happy experience.